Have you ever read a book, thought, “That was really good!” and realised that you hadn’t really grasped more that half of it? That happened again, with another Marguerite Yourcenar novel, just as it had a few years with her more famous Memoirs of Hadrian… I shall be going back to both of them, because there’e so much more in there. This novel was translated into English as The Abyss by Yourcenar’s lover. It’s a bildungsroman in a sense, as it’s Zeno’s life and development that we follow mainly, in the development of the mind of a Renaissance genius and freethinker – so you know really that it’s not likely to turn out well for him. The early sixteenth century, with its explosion of knowledge plus a certain measure of intellectual liberty (in some places) unleashed by the Reformation, holds a fascination for writers; this novel recalled for me the award-winning (and soon-forgotten) Knowledge of Angels by Jill Paton Walsh, and the astonishing Q by Luther Blissett, the only novel I know of written by an anarchist collective… Also in there is an echo of Hermann Hesse’s Narziss and Goldmund, as Yourcenar does spend time comparing the attitudes and fates of Zeno’s childhood companion, too. Zeno’s main interest is scientific – including alchemical – and medical research, many aspects of which were fraught with all sorts of dangers in those days. The rich heir, Zeno’s friend and companion of his early days, rejects that world in favour of soldiering and whoring; they meet up after many years in a significant encounter. Indeed there are many chance encounters and re-encounters throughout this novel, which add layers of depth and meaning to events and characters. The turbulent backdrop of warfare and religious strife forms a panorama to the book; Yourcenar is clearly very interested in what people then knew and didn’t know, what they cared about and didn’t care about. The picture she develops is quite different from our twenty-first century picture of what things were like back then, and her picture of the isolation of thinkers, writers and savants in a time where communication was a lengthy process or hardly existed at all, where one didn’t learn of quite major or catastrophic events until months later is quite an eye-opener. Little knowledge being disseminated, it was possible for significant research and discoveries to be lost forever; equally laborious work might be duplicated unwittingly. It was a long time before a world of new learning had accumulated sufficient critical mass to become a permanent fixture, incapable of being suppressed by religious or temporal powers. Yourcenar also evokes brilliantly through the character of Zeno how the mind of a savant in those times so different from our own might have worked, explored, wandered from subject to subject, and attempted to work things out; from the historical and the psychological perspective it’s a powerful and thought-provoking novel, and a reminder of both how dangerous knowledge can be, and how tenuous our hold on progress and civilisation is, too. I also loved Professor Branestawm’s adventures, unable to read them without collapsing into hysterical fits of laughter; I still wish I could imitate him and send the gas company an envelope filled with mashed potato instead of a cheque paying the bill. Grown-up reading seems rather different to me: as I’ve grown older, I’ve grown out of, or beyond some of the books that moved me greatly when I was younger. I haven’t lost Hermann Hesse’s Narziss and Goldmund and will revisit it every few years for as long as I’m able: it meant something else to me when I was a mere student, and now in my older age it holds very different but just as significant messages for me. I shall also return regularly to Oscar’s adventures in The Tin Drum, to the reflectiveness of Adso in The Name of the Rose, and the magical world of Maldonado in One Hundred Years of Solitude. And – I’m still not sure why, but Josef Skvorecky’s The Engineer of Human Souls demands to be re-read, if only for its magnificent swearing. And if I was to pick out one SF novel, it would have to be Arthur C Clarke’s The City and the Stars: anyone who can project us a billion years into the future earns my respect. Finally, you won’t be surprised to hear, nothing will separate me from Sherlock Holmes (in this existence, at least). Where I’m heading, I think, is towards what has made me love these books for so long, to come back to them so many times. They’re not the only ones that I re-read, by any means, but they means something different and special to me. I suppose that I must have read them at various crucial moments in my life. That’s certainly true of the Hesse and the Arthur C Clarke; I just can’t remember about the others. Some of them are brilliant novels that are on many lists of ‘the greats’, others are probably only great to me. What they share, for me, is the ways they open up life and experience, reveal the vastness of our lives and the universe. Oscar remembers, recreates a vanished world, a place that no longer exists. Many other novels do this, too – Lampedusa’s The Leopard, for example. But the haunting picture of the lost Danzig is overlaid with the many tragedies of its inhabitants: the Jewish toyshop owner who commits suicide, the mixed communities which in the end could no longer co-exist, the Germans who had to leave. Hesse shows us a friendship which lasts many years, a lifetime, in fact. So do many novels. But he also shows what attracts these so very different characters to each other and what sustains the bond across the years when they are on their separate journeys, and somehow manages to link these two men to the wider human condition, our needs for companionship and understanding. As I’ve grown older, I’ve begun to play a game with myself. I have to downsize, perhaps eventually move into some sort of sheltered accommodation, and can only take a hundred books with me: what would I choose from the thousands I currently have? All of the ones I’ve mentioned above would be on the list. It’s a bit like returning to childhood, which is where I began this post: I still have my very first bookcase, which my dad made for me when I was about seven: I gradually filled it up as I grew up. It might just hold a hundred books. One of the things that I find myself thinking quite a bit about as I grow older is happiness. Or perhaps I mean contentment, I’m not completely sure. And for me it’s quite a simple thing, a lot of the time. It involves lying comfortably on the sofa, reading a good book. There’s a glass of good beer on the table, and music playing, probably Bach, Beethoven or Chopin. The iPad is next to me, should I need to check something, or look something up about what I’m reading. And that’s it. Except, not really, because being here in this state of contentment comprehends the people, the family and the achievements and satisfactions that have accompanied me to this place where I am today, and the feelings and loyalties they inspire, too. The idea of contentment doesn’t seem to figure that prominently in fiction, at least not what I’ve come across. Hermann Hesse’s Siddartha is an interesting case, a fictional narrative that imagines the life and spiritual journey long ago, of a man – is he the Buddha? I don’t know; perhaps; it doesn’t actually matter. In his story we see him achieving what he thinks is happiness or contentment a number of times, and subsequently realising that it was not, that something was still lacking and it was time to move on to the next part of the search. It’s a short, tenuous book which is actually better listened to in the librivox recording, if you have the time. One of my all-time favourite novels, to which I return every few years, is Ernst Wiechert’s The Simple Life. A sailor returns from the Great War to Germany, and quickly realises that he cannot fit back into the life he is expected to. So he ups sticks and leaves everyone and everything behind, and disappears into the forested depths of East Prussia, where he comes to find peace and contentment totally cut off from the world, living on a small island in a lake in the middle of nowhere. He makes no demands on anyone or anything, but he’s not a hermit, for he has a loyal companion and is tolerated by the owner of the estate in whose lands the island and lake lie. It’s a slow and lyrical novel – how I wish I could read it in the original German: I’ve tried but it is beyond me – and it’s gradually pervaded by the sense of a man at peace with himself and the world, genuinely happy. And yet, we know and can sense that lurking in the distant background is the gathering storm that will shatter and destroy everything. I find the novel astonishingly powerful. When I think about the various utopian novels I’ve hunted out and read, I’m quite struck by the fact that I don’t recall much happiness or contentment in them, despite the genre and my expectations of it. If I feel anything about William Morris’ News From Nowhere, W H Hudson’s A Crystal Age, or more recently, Ursula Le Guin’s The Dispossessed, I have a sense of worlds which strive to be fair to everyone, which provide a sufficiency for everyone, and there is a general sense of satisfaction about them, but it doesn’t really go any further or deeper than that. Maybe a utopia is inevitably general because it has to convince us that the whole world is perfect; what I want to read is an interesting story set in a utopia, but I suspect that here is where the stasis of utopia might let down the necessary dynamics of a good story. And coming back to happiness and/or contentment, which was where I set out from, I also feel that is an individual matter, rather than a general one. It’s not a very easy subject for fiction, really: too many toes to tread on, too many people to offend. But anything should be open to a writer, and there are some that have tackled the subject, in a number of original and interesting novels. I remember finding Somerset Maugham’s novel The Razor’s Edge very liberating as a teenager, when I was wrestling with religion myself, prior to giving it up and trying to leave it behind for twenty years or more… That is another story, but the novel was about a young man’s quest to find himself, and something to really believe in and bring some meaning to his life, and that struck a chord with me at the time. I suppose it introduced me to the idea of a personal spiritual journey, something that I’ve now realised I’ve been engaged in all my life and will only reach the end of at the end. The hero eventually makes his way to India – a place that loomed large in the consciousness of many in the late sixties and early seventies – and explores Eastern religions and beliefs. Later I came across Hermann Hesse: Siddhartha is a short novel, enigmatic, imagining the life and spiritual development of the Buddha. When I first came across it, I didn’t really understand it; more recently I’ve listened to it a couple of times in an excellent librivox recording and it’s made me think much more deeply. 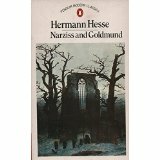 As a student, though, it was Hesse’s Narziss and Goldmund that really moved me and had a powerful effect on me, through its exploration of the contrasting secular and spiritual journeys of its two protagonists and the ways in which they were so deeply interconnected. Novelists who have encompassed Christianity in fiction are rather harder to recall. There was Nikos Kazantzakis’ The Last Temptation, which scandalised many when it was filmed, and the disturbing Knowledge of Angels by Jill Paton Walsh, which looks at the attitudes of inquisitors as they go about their work. I’ve come across – though can only vaguely recall – a couple of interesting science fiction stories which imagine God sending his Son Jesus to other worlds, to alien intelligences, and what might have happened to him on those planets: sacrilege to some, but legitimate speculation for others. I have yet to read Philip Pullman’s novel The Good Man Jesus and the Scoundrel Christ; I don’t know why I have managed to avoid it for so many years. Mikhail Bulgakov’s astonishing The Master and Margarita takes in the story of the trial, condemnation and execution of Christ, from the perspective of Pilate and his wife. It’s only one strand of the novel, but is skilfully woven in, and makes one think, as a good writer will. A final mention, not of a novelist but of one of my all-time favourite travel writers, Ella Maillart, who, after years of travelling and exploring the East, was drawn to India and its religions on her own spiritual journey as she strove to make sense of a world which had descended into the Second World War; her account of some of her search can be found in her book Ti-Puss, which I really enjoyed: her years of motion and restlessness brought her to calm fixedness in India for a number of years, and seemingly allowed her to make some sense of her life in her later years. I’m not sure when writers first woke up to the idea of time travel, though HG Wells may actually have been the first, sending his traveller first of all some 800,000 years into the future to see humanity separated into two distinct species – I’m starting to think that may happen rather sooner – and then untold millions of years to look upon the death of the planet in that haunting scene on the seashore. Wells’ idea was a good one and has been reworked marvellously by Christopher Priest in The Space Machine, and by Ronald Wright in A Scientific Romance, both of which I recommend highly. Other writers have sought to imagine eternity for us, insofar as that is possible for us humans. James Joyce has Stephen Dedalus reduced to a quivering wreck confronted by the prospect of eternal damnation for his sins after a hellfire sermon in A Portrait of the Artist as A Young Man. There is the picture of the walls of hell four thousand miles thick, and the grains of sand on the seashore, each as a year counted off, and making not a pinprick on the aeons of torment: scary stuff. Arthur C Clarke (The City and the Stars) creates a future world where we are a thousand million years in the future, and everyone is randomly regenerated from time to time by the computer that runs the world. And then there is Olaf Stapledon’s masterpiece from the 1930s – Last and First Men – which gradually takes the human race further and further into the future, through various races of man and moves to other planets, before the end must come when the sun dies: our own petty concerns and memories are cruelly shrunk to nought by the stupendous weight of the years counted off. I wrote generally about philosophy in a recent post, and it occurred to me I should develop my thoughts and look at philosophy in the literature I’ve read. 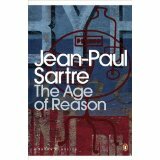 I suppose I must first have met it when I read Sartre‘s novels all those years ago: The Age of Reason, The Reprieve and Iron in the Soul seem to have been compusory teenage reading in the ninetee-seventies – all that existentialism, and attempting to live by it. It made a stunning BBC TV series in the seventies, too, one that I and many others would live to see again, but I’ve never really felt tempted to return to the novels. Another philosophical novelist I encountered at roughly the same time was Hermann Hesse, and I have returned to some of his novels recently (Narziss and Goldmund, and Siddartha, via Librivox). In the former, his two heroes spend their lives seeking out paths to live by, one through religious and contemplative life and the other through travel, exploration of and involvement with the world; it’s still one of the most moving books I’ve ever read. Siddartha tells the story of the development of the Buddha; it’s still, for me, the clearest exposition of Buddhist teachings and way of life I’ve read, and far more accessible than that faith’s philosophical and sacred texts. 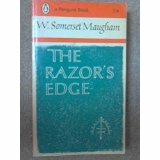 Again, as a teenager, I read Somerset Maugham‘s The Razor’s Edge, another story of the search for a way to live and a meaning to life, a bildungsroman of the kind that would appeal to a teenage male looking out at the potential of the whole world for the first time. One of my favourite novels of all time, which I only came across a decade or so ago, is Ernst Wiechert‘s The Simple Life. It explores and espouses quietism and flight from the world, perhaps a perfectly understandable response to the Great War. And also quite stunning in terms of its evocation of a sense of place. If asked to choose my favourite travel writer of all time, I think it would be the Swiss traveller Ella Maillart, whose travels and explorations in the first half of the twentieth century led her to India and Hindu philosphy and yoga in her search for tranquillity and a meaning to existence towards the end of her wanderings; Ti-Puss is an account of some of her time and adventures in Southern India. Most recent discovery of philosophy in a novel (only available in French, I’m afraid) is the story of the eleventh century Arab doctor and savant Ibn Sina, known in the West as Avicenna. 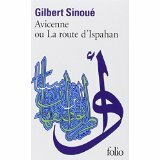 Gilbert Sinoué‘s novel Avicenne ou la Route d’Ispahan is a marvellous imagining of his life, trials and tribulations. I’ve often written of, and spoken about, novels that have made me think; those I’ve mentioned above have taken that quality a level deeper, as it were. I’ve always been fascinated by Germany, its history and its past. I first read Günter Grass in the sixth form at school, the short Cat and Mouse first, a little thrown by the nature and development of the narrative and the authorial interaction with his reader, but drawn in by his yearning for and love of his home city Danzig which I’d visited the year previously in its Polish incarnation as Gdansk. For me, The Tin Drum, his first novel, remains his best (and Volker Schlondorff‘s film is a wonderful version, but only of the first half of the book); some of the later ones are a little self-indulgent. His memoirs, the cause of much controversy, are fascinating. Grass, and his contemporary Heinrich Böll, were two German writers who made the attempt to come to terms in some way – if that is possible – with their country’s Nazi past; Siegfried Lenz also does this in two novels little-known in this country, The German Lesson and The Heritage. On my travels in Germany I’ve noticed that nation’s recent attempts to be honest with itself, and to ensure that the past is not forgotten (though it was not always thus). However, I have found the occasional slight hint in some quarters ‘don’t forget, we were victims too’ à propos of the damage inflicted by bombing on the country, or the expulsion of Germans from former territories, to stick quite heavily in my craw. My reading of German literature has been mostly twentieth century novels, though I have read some Goethe (Elective Affinities) and loved Fontane‘s Effi Briest. I have been unable to get anywhere with Thomas Mann, I’m afraid. 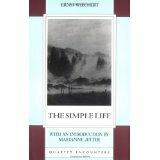 My favourite read of all remains Ernst Wiechert‘s The Simple Life, a haunting tale of a sea captain’s response to the horrors of the Great War: he flees everything and buries himself in the depths of the East Prussian countryside, to live the life of a hermit. It’s a beautiful book, which I’m sure appeals to the ex-hippy in me; I have to go back and re-read it every few years and it never palls. Hermann Hesse was the big discovery at university – another writer briefly popular in the sixties and seventies but who has now slipped back into obscurity. Siddhartha was the most widely-read novel (there’s an excellent Librivox recording, too) although it was Narziss and Goldmund, a tale of two young men and their relationship in mediaeval times, that really spoke to me. Again there was a really clear sense of time and place, and of the longing for something sought for and lost. This seems to me, on my limited acquaintance with German literature, to be one of its markers or strengths: the past as somewhere beautiful and hearkened back to, along with the need to know and find oneself. Perhaps it’s something about the landscape and territory the further east one goes? The plains and the forests stretch on for miles and miles and it’s possible to get really in touch with one’s relative insignificance. Being reasonably familiar with Gdansk, and what was East Prussia (most of it is now part of Poland) I think I can understand the feelings of Wiechert, Lenz and Grass. What I know of Germany, and what I have seen of it, I love. For me, as a half-Pole, its recent past does render it ultimately incomprehensible, though.